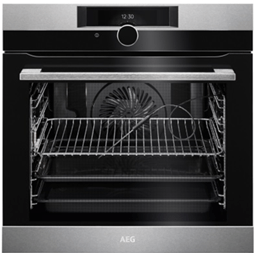 AEG have recently launched five new appliances in their Mastery Range that provide an enhanced cooking experience. These items are both stylish and practical and will make a real difference to your kitchen experience. The linear lines and contemporary appearance make them a good choice for the style-conscious, but they are also energy efficient which widens their appeal. The SenseCook Pyro Oven’s Food Sensor works intelligently in sync with the Command Wheel, giving complete control in the kitchen. The Food Sensor monitors the core temperature of the food, predicting how well done the food is. The Food Sensor also works in tandem with the interactive Command Wheel. Just touch the Command Wheel and the cooking settings appear on screen. This allows you to monitor the dish and check how well done it is. 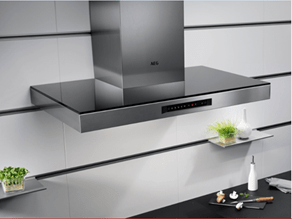 With a beautiful chimney style, the Hob2Hood’s high-performance hood effectively cleans the air in the kitchen with its energy efficient motor. It features the intelligent Hob2Hood system and works in harmony with your hob. Once the hob is turned on, a wireless signal is sent to the hood, instantly measuring the right amount of extraction required to keep the kitchen steam-free. It also features SilenceTech Technology, reducing the noise levels down to the lowest number of decibels. The MaxiSense Combi Hob has pioneering technology offering outstanding responsiveness. It features a FreeZone which is similar to a chef’s hot plate, allowing up to three pans on one zone. 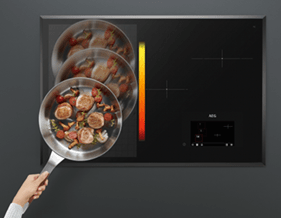 There are DirekTouch controls for fast, precise heat selection to exact temperatures. The Powerslide function turns the MaxiSense Combi Zone into a varying temperature hot plate with full power at the front and simmer power at the back. 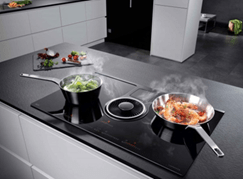 The AEG ComboHob combines an induction hob with integrated extractor into one product. It can be placed anywhere in the kitchen and features Hob2Hood Technology which intuitively controls the extraction power to match your cooking. The hob also has a glossy glass surface to add to the stylish, pristine appearance. The integrated hood also has a removable filter. 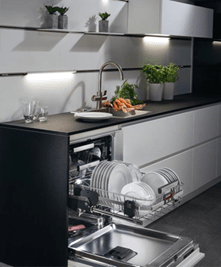 The ComfortLift is the first dishwasher of its kind. The innovative feature is a unique mechanism that lifts the lower rack to a comfortable working height for flexibility when loading and unloading. It has a three-drawer capacity and powerful AirDry Technology that utilises the natural airflow to finish the drying process. Simply open the door by 10cm in the last part of the cycle to achieve maximum drying performance. Flexible installation with sliding hinge. The AEG CustomFlex is an adaptive fridge freezer that uses a cooling system that preserves taste and texture efficiently and features customisable doors. The TwinTech cooling system prevents food from drying out and maintains optimum temperature and humidity levels. DynamicAir Technology maintains the airflow inside the fridge so the temperature is consistent at every shelf level. Previous story Would You Use Spyware On Your Partner? Next story Huawei P10 Plus – The camera to beat!